Shortly after Emily got introduced to the 'blogosphere', the amount of time she spent checking everybody's blogs for new posts started to interfere with our daily lives. Fortunately, I had just the solution for her, RSS feeds. Emily has told many of her friends enthusiastically about how RSS feeds have changed her life. I believe the conversation usually starts with something like, "My husband is a nerd, and so ..." It is true that for the most part only computer nerds know about RSS feeds, but I thought I would post this little tutorial to bring the rest of you in on our little secret. The idea behind RSS feeds is that instead of you going to check a website to see if there is something new, shouldn't the website tell you when there is something new? Then you only go to the site when you know there is something new. So the way it works is you subscribe to the website's RSS feed using something called a feed reader. Then you check your feed reader like you would your email and it will show you if any of the websites you care about have new stuff. For blogs this means you never have to check anybody's blog unless they have a new post. It is pretty easy to set up and once it is set up it is just as simple as checking your email. OK so here is the tutorial on setting it up. instead of to get on the internet. 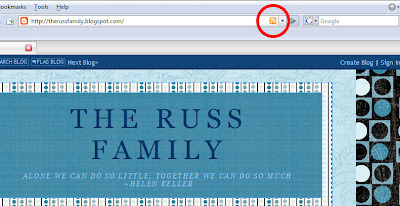 3) In Firefox go to the website or blog that you want to subscribe to. 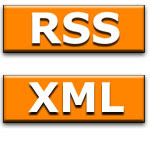 If the site has an RSS feed you will see a little orange RSS icon in the address bar. Click on the orange icon to subscribe to the feed. This is the easiest way. Alternately, you can look for a link on the website. Blogger usually puts the link at the bottom of the page where it says "Subscribe to: Posts (Atom)". If your friend has made their blog private then the RSS feeds will be disabled, and you won't be able to subscribe to their blog. 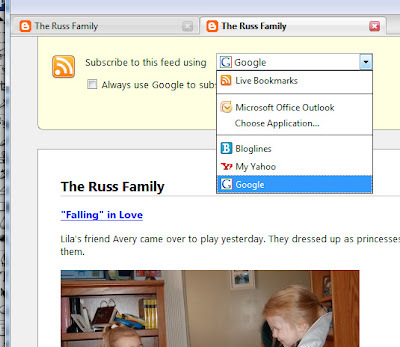 You can click on the drop down menu to pick Google, Bloglines, or whatever you want to use as your reader. Then click on the subscribe now button. 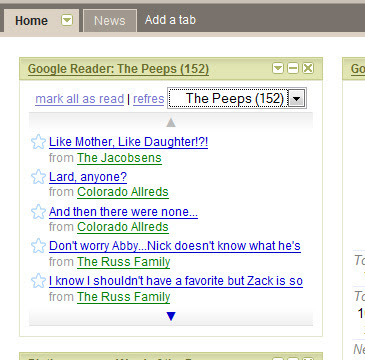 5) If you picked Google Reader this page will come up. 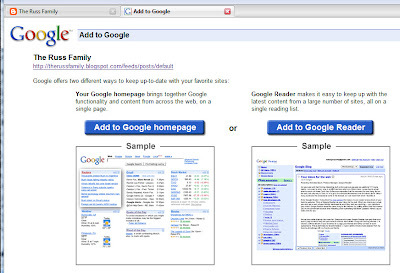 Click the "Add to Google Reader" button. 6) It may ask you to log into your Google account then it will bring you to your Google Reader. You will see the blog you subscribed to on the left and it will list any of the recent posts that you haven't looked at. Once you have added all of your blogs and websites, then you just check Google whenever you want to see if there is anything new for you to look at. You can click the blue title of the post to go to the actually blog and leave comments, etc. If you want to make things extra easy you can use Google's custom home page as your home page. Just go to Google and click on the iGoogle link in the upper right hand corner and sign in. Then it will make you a custom home page that has news, weather, etc. on it. click the 'x' on any of the boxes you don't want. Then click the 'add stuff' link on the right to add Google Reader, Google Calendar, or Gmail. Type in 'Google Reader' in the gagdet search box. Then when it finds it click on the 'Add it now' button. 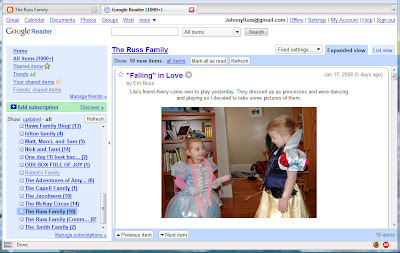 Now you will have a little Google Reader box like this on your homepage. Now keeping up to date on your friends' blogs requires almost no effort on you part. Just click on the links to be brought to the latest post. 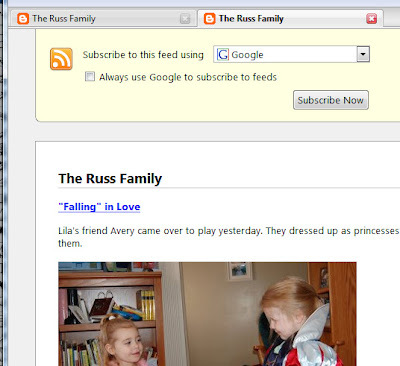 As a bonus you can subscribe to an RSS feed with all of the comments on your blog or another blog. 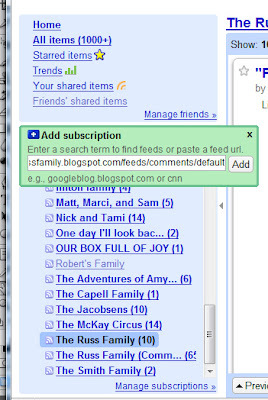 In Google Reader click on the add subscription link and type YOUR_BLOG_ADDRESS/feeds/comments/default, obviously using your actual blog address. I hope this wasn't too technical, and most of all I hope it saves you from wasting lots of time checking on blogs that haven't been updated. Let us know if it works for you in the comments. ahhh, Google Reader has changed my life! I LOVE Google Reader almost as much as I love my nerdy husband!! You are phenomenal!! Thanks for all of that! I think I got most of it from our phone conversation today (I knew you were the one to call!!) but now I can read it and make sure! Awesome..by the way, you are an amazing technical writer! Maybe you should work for Google or Blogger or something..Just a thought? Johny, I must admit... helpful but definitely computer nerd! What a great idea. I do spend so much time going to blogs that have old stuff on them as opposed to new stuff. Thanks for understanding computers and sharing that with us! 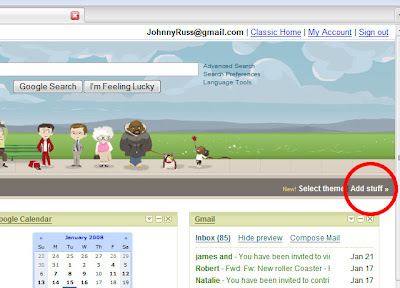 Johnny you'll have to talk to Brian about RSS feeds. We tried to enable it on our blog, but we couldn't because our blog is private. Dare internet pervs making it impossible to enjoy the new technology on the web!!!! If you think we did something wrong, let me know. Sorry Emily I'll just e-mail or call you when we update our blog. After reading your post a little more carefully I noticed that you noted that a private blog would not allow RSS feeder, so ignore that part of my previous comment! Johnny, kudos for the longest post in the history of the world..hahahah, JK. BTW, you still need to change our URL, we chagned it a lil while back. I am refferring to the link on the side of your page. It still has the old address. I love the part where you wrote "only computer nerds know about RSS feeds"... To varify your point, I asked Casey what it is, and he went into this long explanation about what it is. Did I ever mention that I'm glad we have Johnny because sometimes Casey talks to Johnny about all of these technical things and so I don't have to hear about them. Nice post, thank you for the awesome instructions. Johnny, this obviously works if your blog is open to the world, but what about people who have gone private because of creepy people visiting their blog? WOW I am impressed- and just reading that makes me glad for people who are good with computers. As you can see just trying to update my own blog rarely happens since that is still one huge task for me:) Thanks for all the comments on our blog! You guys have the cutest family. We miss living close to you but we definatly dont miss the snow!!! I am loving FL right now! now i know how and why Emily's always the first person to comment on my new posts. I'd been telling myself that she just LOVED my blog so much that she checked it 4-5 times a day....well, that lie's over. :) Thanks, Jhonny, for the info. you've save me a lot of time!! Thank you so much - that is wonderful advice!! hey, i'm impressed with MYSELF for once because i actually already have a google reader set up and use it as my home page... i was so happy to see your post and see that i'm not completely computer dumb.. So yeah, I don't waist that much time looking at people's blogs, because I only have like 4 friends. Thanks, anyway. Hey this was awesome advice! It took me some time, but I did it and I am excited to used it. Thanks for the awesome screen shots and instructions.